This is part two of a 5-part post from my recent visit to Oahu in July featuring the following places: Curry House, Angelo Pietro, Kaka`ako Kitchen, Elena’s, Yotteko-ya, and Popeye’s. I’ve passed by this place many times whenever I visit Oahu since all the stores/movie theaters are nearby. It always looked appealing to try this place… a local plate lunch place sitting on high priced real estate? The food gotta be good there, I thought. I’ve also heard some good things about this place. I was able to try this place out for a late breakfast/early lunch this past July. There was a good amount of people considering it was before 11am, but we found that we just missed breakfast. We were sad because we wanted to try the loco moco, and they consider the loco moco a breakfast food(! ), so they wouldn’t serve us a loco moco. C’mon now, what kind of place only serves loco mocos for breakfast? Who says a loco moco is just breakfast food anyway? They had hamburger steak — how much harder would it be to make a loco moco? Depriving a Hilo boy of his loco moco is a very bad idea! Other than the loco moco inconvenience, the place was really nice (I only have food pics, sorry). Everything looked really clean and there was a nice open sunny vibe about the place. The people were actually nice besides the loco moco thing. If you are eating in, you place your order at the counter, then they give you a number. When your food is ready, they bring the food to your table, which is nice. After a lot of thinking, I ordered the Beef Stew ($6.25) with brown rice and mac salad. What a perfect breakfast, right? The beef stew was good and satisfying, but not really good. It tasted like regular homemade type of beef stew, but without the love… not as good as da one gramma or aunty [insert name here] makes. There was too much vegetables for my taste and I prefer more bigger fatty pieces of beef. The mac salad was not bad. 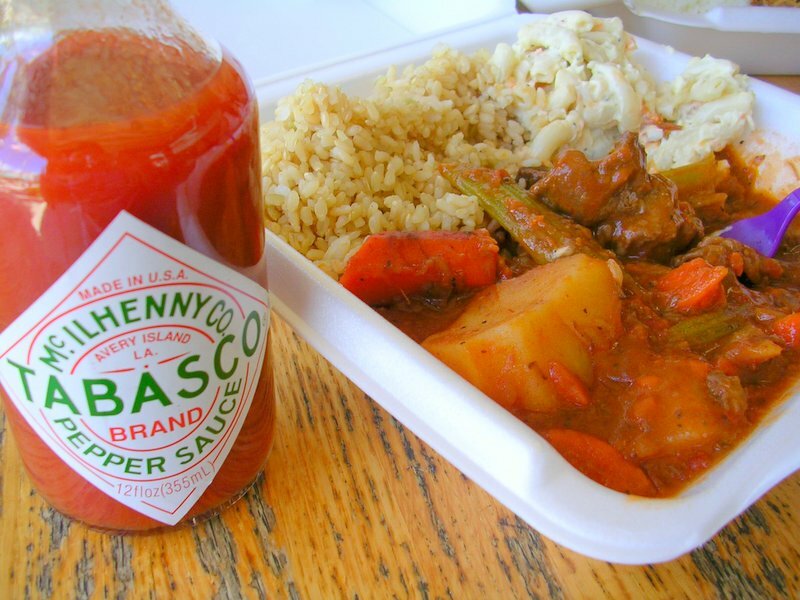 Gotta have tabasco, right? 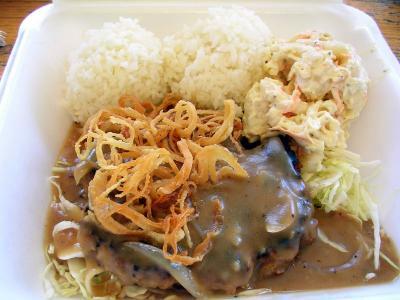 Bev ordered the hamburger steak ($6.25), the closest thing to a loco moco. Bev thought the hamburger steak was just ok. It was good at first, but it got tiring to eat after a while. 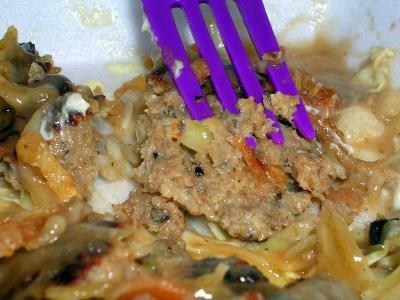 The consistency of the burger was very mushy like a soft meatloaf, but without the yummy meatloaf flavor. The outside of the burger was also burnt. I like slightly charred burgers, but there is a difference between a nicely charred burger and a burger burned by frying it too much. The gravy was good, though, and the onions on top made for a nice texture combination. Overall, it was acceptable, but like the beef stew, it wasn’t that great. We might’ve just ordered the wrong things. I’m willing to give this place another chance, but I’m not too excited to come back here. This entry was posted by James on Thursday, September 1st, 2005 at 1:56 pm	and is filed under Oahu, Plate Lunch, Restaurant Reviews. You can follow any responses to this entry through the RSS 2.0 feed. You can leave a response, or trackback from your own site. BRAH! you should have gone wit da katsu….or a teri plate…..alwais a winna! The food at Kaka’ako Kitchen has gone downhill fast. The food is not consistently good and the prices have increased. For the price one pays, I would much rather go to L&L (and I don’t really like L&L all that much either). Reid, I’d much rather have went to L&L too… at least they are pretty consistent with the quality.. even though it is just mediocre. 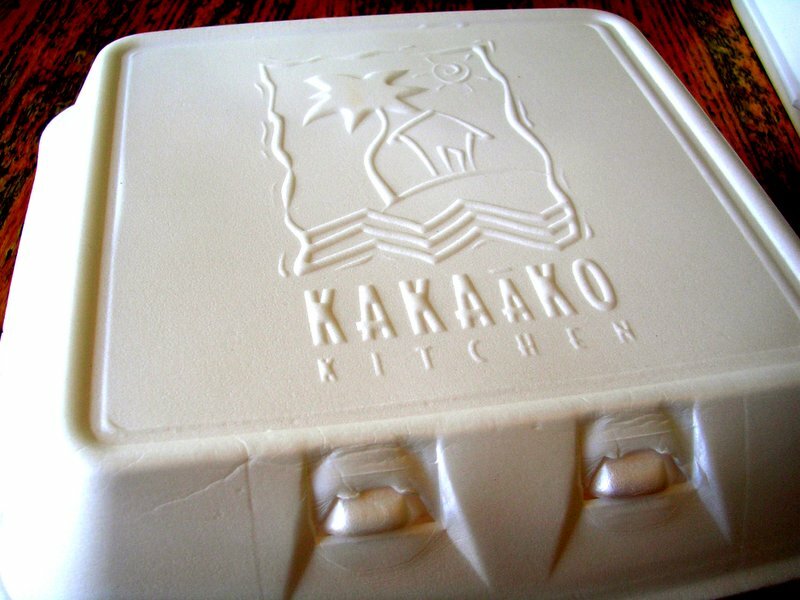 After I posted this, I checked out your Kaka`ako Kitchen review. It looks like you didn’t have a great experience either. As for Kakaako Kitchen…before the moved to their new location they had an absolutely killer hamburger steak. It had a really dark brown gravy with a bit of spice instead of the bland stuff they have been serving lately. I loved their Chicken Picata but that they have removed entirely from the menu now. I haven’t tried the Katsu yet but I haven’t found any place yet that has Katsu as good as Grace’s or Bob’s.